Yee hah! 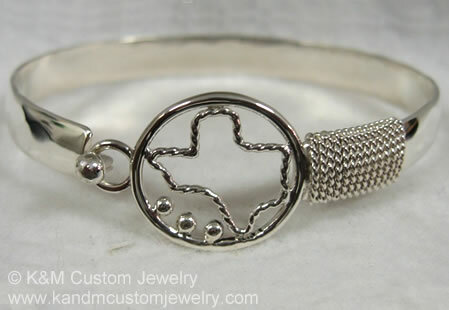 Get your gal this sterling silver Texas bracelet by K&M Custom Jewelry and she'll love you forever! Of course, I tell my husband that if he'll fix his own dinner (or run to the bank or clean my bathroom . . .), I'll love him forever, which is really a meaningless promise since he already knows I'll love him forever. 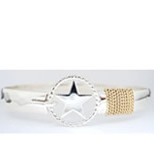 The Texas State Bracelet was designed and is created by Kurt & Michelle who handcraft their jewelry in Amarillo, TX and features the outline of Texas in a silver bangle bracelet, sized especially for your wrist! 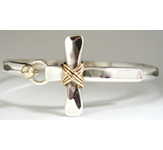 That's what you call custom jewelry. 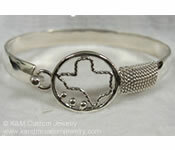 Buy the Texas State Bracelet or other jewelry at K&M Custom Jewelry. Link opens in new window. And tell 'em Truly Texan sent you!